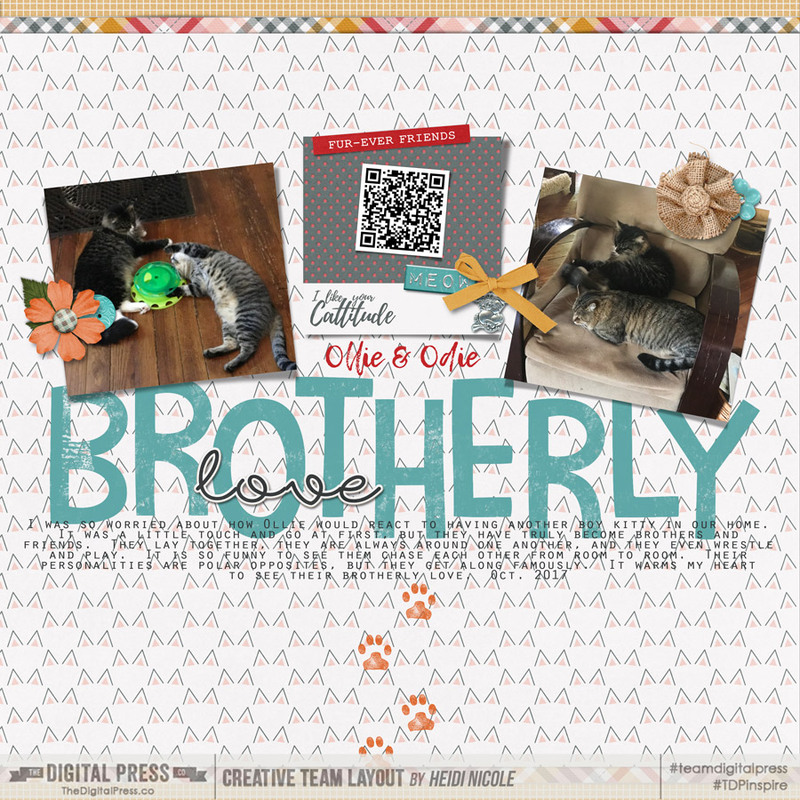 Welcome to another edition of Tutorial Tuesday here on The Digital Press blog! 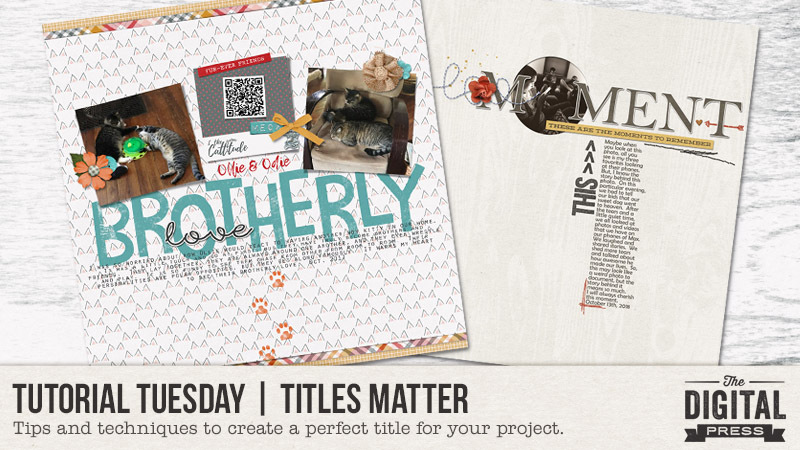 Today I’m going to talk about using titles in your digital or hybrid scrapbook pages. Titles actually do matter. Why, you ask? The title gives your page a clear and concise connection between your photos and your journaling. Basically, it ties together the ingredients in your memory-keeping. 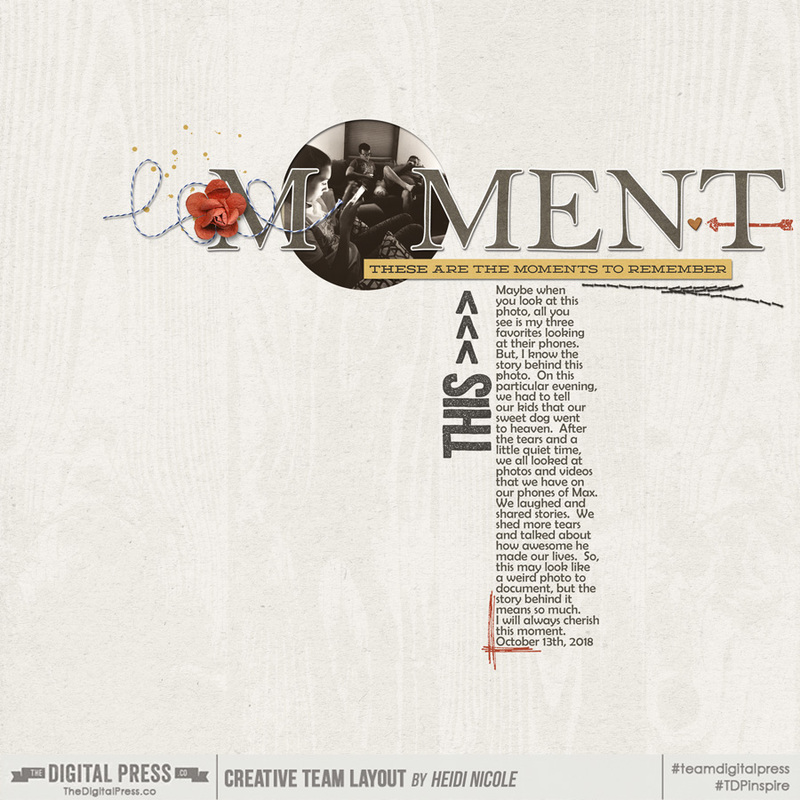 It can often create balance in your layout, and it can even be the focal point of your project. Titling my projects is something that I sometimes struggle with, but as I learn more about the elements of a balanced scrapbook page, I realize it’s an important piece of the whole and not to be ignored. In that spirit, I have for you a few tips and techniques that can assist you in creating a unique and clever title. Keep it short. A long, wordy title can easily dominate a page or project without intention. Remember, you want to create balance… so the title should be just a few words to let the viewer know at a glance what to expect from the project. Your journaling will then explain in more detail what the story is and how it connects to the photos. Use the tools available. Pinterest has countless pins that can be used for title inspiration. When I mean countless, I mean it. There are so many ideas and themes and quotes, the mind boggles. The other valuable tool that I absolutely treasure and use all the time is an online thesaurus. It’s literally as simple as typing in a word and hitting enter. You will get loads of synonyms for that particular word. Word of advice, though… maybe don’t use it on every word (like Joey… high five to those that got that without watching the video!). Once you have figured out what your title is going to be, you just need to figure out how you are going to incorporate it into your project. Speaking for myself, as I start to plan my layout I often use a ‘place holder’ for my title. In other words, I typically just type ‘title here’ on my draft page, and as my layout evolves I can move it and size it to create balance. You can use alpha sets or fonts to create titles (for more on mixing fonts for titles, check out Tutorial Tuesday | Combining Fonts). Titles can even be shadowed or distressed to look like stamps. They can be very large or small depending on how many photos you have on your project. You can even use word art or pre-designed titles. The possibilities are truly endless. As you can see, the title in each layout becomes part of the layout… which creates a complete, balanced, design that is easy on the eye. My hope is that using these tips and examples will inspire you to create a catchy title for your next digital project! 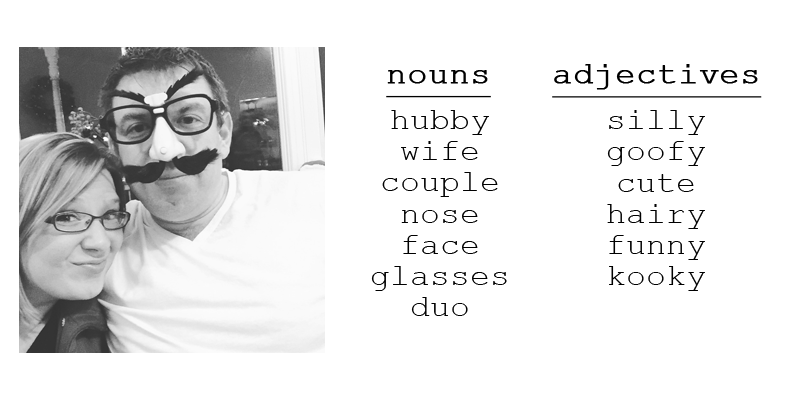 Maybe you are a rock star and you always title your layouts, but if you are anything like me… it will take a little bit of effort (and trial and error) to create a beautifully-titled page. Either way, we can learn from one another and inspire each other… and with that, I hope to “see you” in the gallery at TDP! About the Author: Heidi Nicole is happily married to an amazing man, a step mama to 2 wonderful kiddos, and mama to 3 sweet and sassy furbabies. She’s a radiation therapist by day and creator of pretty things by night (she’s pretty confident that she’s hit super hero status, but refuses to wear a cape.) She loves cats and huskies, coffee, audio books, FRIENDS reruns, St. Louis Blues hockey, cooking, baking, and traveling. Oh, and wine… she really likes wine. She lives a normal and happy life, and enjoys all the absolutely extraordinary people she gets to share it with on a daily basis!